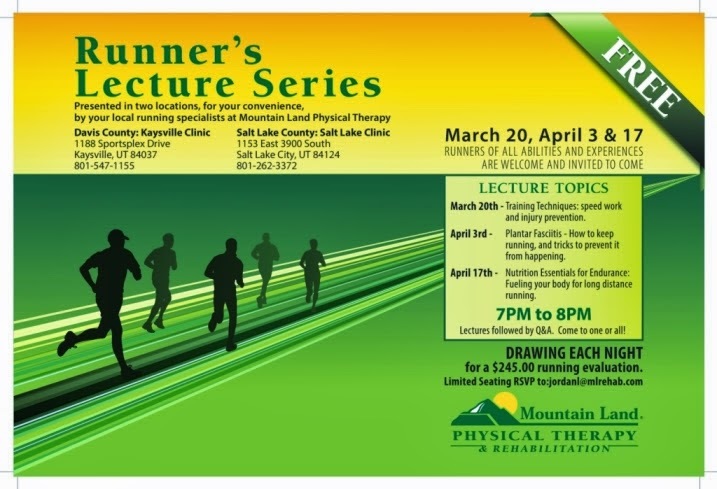 Come and enjoy our next running lecture series. Bring your friends. It will be good time. Copy and paste the link below for the further information regarding the upcoming series. Morgan Valley Marathon. Great Race! Come and Enjoy! The 4th Annual Morgan Valley Marathon, Half marathon, 10K and 5K fun run will be Saturday July 26th! If you’re looking for that perfect race…you have found it! MVM has a beautiful, scenic course with amazing volunteers and aid stations. The race shirts and medals are awesome and you will receive a race bag full of fun swag! You’ll be amazed at what’s inside! All registered runners get a FREE pasta dinner at the Friday night expo…MVM doesn’t stop there.. Have you ever ordered an expensive photo from a race? Well not at the MVM, all photos are FREE! Whether you’re on the course, crossing the finish line or posing with your MVM medal.. All pictures are free!! It’s almost like we’re paying you to run!! To register for a race go to..www.morganvalleymarathon.com.. Use the promo code THROWBACK for a $20.00 discount on the marathon, half marathon or 10K.. and receive $10.00 off the 5K!! Come and experience this one of a kind event! The Morgan Valley Marathon has it all and MORE!!! Obviously, we are always looking for new members...but this post is in response to a comment I received a while back. I got a comment, on this blog, from a Kathryn requesting to get information on our running club. Unfortunately I have not been able to figure out how to get a hold of you...So, if this is you - please contact me again, and you can do it via my email. jer.stoker@gmail.com Then we can get you on our email list. Don't forget...tomorrow night is the last lecture of this series. We are talking about nutrition, and fueling yourself for endurance running. I am excited the for the guest lecturer we are having come. See the post below for more information. Let me know if you have any questions. Just wanted to post a heads up for everyone about my next Running Lecture Series. They are held at my clinic in Kaysville. See the flyer below for further details. Also, don't hesitate to contact me with any questions. Happy New Year! I hope all of you had a great holiday season. Now that the festivities and busier schedules are calming down - I thought we could start getting back together. I wanted to try something this year. We are going to have a "regular" time to meet (at least for the next few months and we will see how it goes). We are going to meet the third Saturday of every month in the morning. Time and miles/activity may vary - but we will still meet the third Saturday of each month. So, for January we will meet on the 18th at 7:30 am. We will be running 4 miles. If you are planning to run more than that on that day - still come join us for 4 of your miles. And likewise, if you don't think you can make 4 miles - come and do what you plan on doing. Bring your friends and let's grow the running club. Let me know if you have any questions. See you all on the 18th. Just wanted to invite everyone to the lecture series my colleague and I are putting on. It will be great! Tonight is the first lecture, and goes for the next two weeks on Thursday nights. Each week will cover a different topic. See the flyer for specific details. Let me know if you have any questions. Thanks, and happy running. Who are the Wind Runners? A group of runners/walkers of all ages and experiences. I am a runner who lives in South Weber, and I am amazed at the amount of runners I see out there running. I wanted to start a running club and thought it would be good to combine our efforts and support each other in our individual running endeavors, whatever they may be. I have big dreams for the running club, and would love everyone’s support. The club is not meant to be a burden but a help, and would allow for you to participate as much or as little as you want. I would like to get enough participants that when we do a group run, there will be plenty of runners at each pace. I hope the running club to be a source of information and inspiration, where we stay active and healthy, get discounts to races and maybe even lobby for running trails along the river.